Dr Martens Falcon: Lightweight and non-metallic safety boots, suitable for airports. They have Water Resistant full grain leather upper. The Falcon Safety Boot is Anti-static and has rubber, slip resistant outsole (SRC). It has a breathable lining and Smart-Mask PU cushioned foot-bed. This boot is lightweight and flexible. Puncture Resistant Sole protects against the threat of underfoot hazards with puncture resistant midsole plate. Dr Martens Falcon Safety Boot conforms to: EN ISO 20345:2011 S3 SRC HRO safety footwear standards. Manufactured from top notch water repellent leather. The toe cap is composite and perforated and has a breathable membrane improving user comfort. Designed with a strong classic steel midsole, preventing any punctures. The outer sole is anti-slip, antistatic and hard wearing. Upower Taxi Honey Boot conforms to: EN20345 S3 SRC Safety Standard. Oiled leather finish for greater durability. Composite toecap which is 50% lighter than steel. Soft L-protection® nail protection and a uniquely integrated ankle support system. Dual density heat resistant PU/nitrile sole resistant to most chemicals. Scuff toecap gives added protection and prolongs the life of the boot. The heel is composite, giving greater support to the wearer. Limited stocks available, so buy them while you can! Super tough waxy buffalo leather material Upper. Oil, acid resistant and SRC rated slip resistance. Goliath Black Safety Boot SDR10SI conforms to EN ISO 20345: 2004 EN345 S1 P safety footwear standards. Wide fitting safety hiker boot from Blackrock, with steal toecap and steal midsole. Padded collar, Nubuck and mesh uppers, hard wearing PU/Rubber sole, and a fully moulded and removable insole. 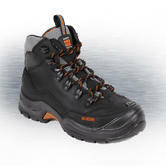 Blackrock Fusion Safety Hiker Boot conforms to: EN20345 S1-P SRA safety footwear standards. A top quality boot from Honeywell Bacou 783, this boot is one of our most popular brands and one of our biggest sellers. These boots have fantastic features to keep your feet warm and dry at all times (BAC'RUN SPECIFIC PRO BTP). Water resistant oiled full grain leather upper, will keep out moisture and water whatever the weather. The 200J SPACIUM™ injected polymer toe cap, will protect your toes against falling objects. The composite Toe cap is low in weight providing unhindered movement speed. Dual density PU foam insole gives great performance for a soft, durable instep. The dual density polyurethane will offer you brilliant slip resistance on a wide variety of surfaces. 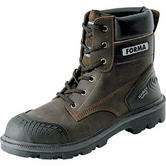 Overall a fantastic boot which will give you great service, also offers great value for money. This boot is S3 rated , protecting the user from any underfoot spikes like nails. Complies with EN ISO 20345: 2011 S3 HI CI SRC safety standards. Conclusion: This is an Excellent boot: it has true Comfort, Stylish and is Lightweightand Flexible. Everything a work boot should be: safe, tough and comfortable. Every detail was considered in this full-grain leather boot: padded collar and tongue, removable, leather-lined, cushioned insoles and raised exterior ridges on the arch for additional grip. This work boot features our patented SFC Mighty Grip outsole and meets approved EN 20345 standards. Non-metallic polycarbonate safety toe, textured reinforced toe for extra protection and greater durability. Its inner lining helps keep feet dry. Shoes for Crews Icon Shoe 5091 conforms to: EN 20345 S2 safety standards. 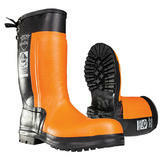 Cofra Strong Chainsaw Boots are ideal for protection when using chainsaws. Featuring a 100% Cambrelle breathable lining that absorbs and releases moisture. They have Sawtech for protecting against chainsaw cuts. They have non-metallic APT Plate protection in the fore-part. This footwear protects against chainsaw cuts - with the additional Metatarsal protection covering the laces. There is special protection in the forepart: Non metallic APT Plate. Compliant with EN 381, EN ISO 17249 Chainsaw protection to 28m per second. Leopard is a zip and lace, high leg boot. It makes the perfect alternative to the traditional rigger boot - as the zip gives easy access and the lace gives best ankle support. It has a high bellows tongue and padding - to keep out dirt and extra comfort. Moisture-wicking lining for daylong comfort. Grain leather upper and Nubuck is used for tough, supple uppers with good breathability, comfort and long life. Upper leather keeps its shape and is water-repellent. Its water resistance meets the requirements of the EN 345 standard. The reversed zipper is more durable than a traditional one and prevents dirt from accumulating on the zipper and footwear. Warm fleece lining and a felt insole with aluminium layer keep feet warm. Flexible FlexStep® sole that is anti-slip even in sub-zero temperatures. Steel midsole Prevents sharp objects from penetrating through the sole and its resistance to nail penetration is 1100 Newton. Steel Toecap Protects toes from falling objects and compression. Its shock resistance is 200 Joules and resistance to compression: 15,000 Newtons. It has an external toe scuff protector. Safety footwear equipped with Heat Resistance symbol can be worn in hot environments. The patent nitrile rubber sole withstands heat up to 300 °C. Footwear equipped with antistatic design discharges the static electricity accumulating over the body. The tolerances of the resistor are 100 kilo Ohms - 1000 mega Ohms. Light and snug ESD boots are a controllable and safe method of discharging the static electricity accumulating over your body. The limit values of ESD footwear resistors are stricter than with normal antistatic footwear (100 kilo Ohms - 35 kilo Ohms). Wearing ESD boots, you can avoid damaging extremely sensitive electronic equipment. Warm lining Footwear equipped with this symbol can be worn in cold conditions. The material keeping the cold out is lamb's wool /artificial material. In addition, part of the range is lined with effective Thinsulate® fibre. The sole structure designed by Sievi provides the footwear with good energy absorbency which prevents shocks from causing damage to feet, knees and back. Has a useful side zipper, for ease of donning, and extra safety. 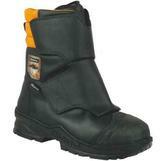 Sievi Solid XL+ Warm Fleece Lining S3 Safety Boot conforms to: EN ISO 20345 S3 ESD Safety standards. It has been become a proven favourite, since first adopted by BP on their North Sea rigs, over 10 years ago. Steel mid-sole resistant to 1100 Newton nail penetration, Steel toecap shock resistance 200 Joules and compression resistance 15,000 Newton. Water repellent Permair Protector upper leather, with fabric (rather than fur) lining on the inside. This gives it better resistance against oil and chemicals than normal leather. 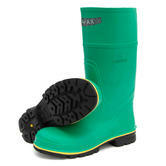 Excellent slip-resistant properties - Sole is resistant to oil, fuel and many chemicals. Antistatic design discharges the static electricity accumulating over the body. The tolerances of the resistor are100 kiloohms ... 1000 megaohms. ESD provides a safe and controllable method of discharging the static electricity accumulating over your body. The limit values of ESD footwear resistors are stricter than with normal antistatic footwear (100 kiloohms ... 35 megaohms). ESD can avoid damaging extremely sensitive electronic equipment. The FLEXSTEP sole structure designed by Sievi provides the footwear with good energy absorbency which prevents shocks from causing damage to feet knees and back. Used widely across North Sea rigs. Conforms to: EN ISO 20345: S3 & ESD standards. 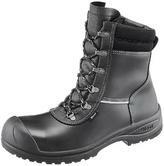 Waterproof black safety boot with steel toe cap and midsole protection. Water resistant leather upper and fully waterproof breathable mesh lining. Reduces foot fatigue with its shock absorbing heel of up to 20 joules. Secure fitment offered by seven hardwearing metal D-Ring lace holes. Padded bellows tongue prevents debris entering boot. Amblers Safety FS218 Waterproof Safety Boot conforms to: EN ISO 20345:2011, WR+SRC, S3 safety footwear standards. Padded ankle collar for support and comfort. 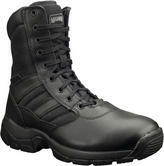 The Goliath FB300GTX is a pull on specialist lightweight safety firefighter boot with full grain black leather. It has a fully waterproof Gore-Tex® lining, rubber bump cap. Dual Density Rubber (DDR) outsole and midsole for long life. There are two pull on handles for easy donning and is deep cleated for great grip with defined heel and ladder grips. The boot also features; NOMEX® fire-retardant threads throughout, ankle protection on both medical and lateral sides of the foot, a shock and energy absorbing heel zone, reflective hi-vis profile to lateral sides, and a padded collar with comfort padded cushion footbed. The sole is resistant to slip, oil, acid, water and heat to 300 degrees C.
This boot has a stainless steel midsole and toecap, impact resistant to 200 joules. External ridged rubber bump cap for long wear life. Deep cleated for great grip with defined heel and ladder grips. Ankle protection on both medial and lateral sides of the foot. Reflective Hi Viz profile to lateral sides. Comfort Padded Cushion footbed - both removable upgradeable and washable. Goliath Firefighters Pull on Boot FB300GTX conforms to EN ISO 15090:2012; EN ISO 20345:2011 S3 SRC HRO standatds. Classic safety footwear model with lightweight aluminium toecap. Upper material is durable and water- repellent PU coated leather. Flexible sole absorbs impacts to back and legs, reducing muscle fatigue. Full length and shaped felt insoles provide added comfort. Certified ESD: this helps you avoid damage to sensitive electronic equipment. ESD footwear is designed to reduce the accumulation of excess static electricity by conducting body charge to ground, while maintaining a high enough level of electrical resistance. Discharges static electricity up to tolerances of 100 kΩ - 35 MΩ. The shock-absorbing heel area protects the feet and the skeletal system against stress. Sievi Auto ESD 44-52204 Safety Shoe conforms to: EN ISO 20345: S2 SRC ESD footwear standards. Wide fitting S1-P safety trainers from Blackrock. Features include steel toe cap with scuff cap, steel midsole, hard-wearing PU/Rubber sole, and Nubuck/mesh upper with padded collar. Quality safety trainers at a great price. 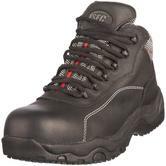 Blackrock Fusion SF45 Black Nubuck Safety Trainers conforms to: EN20345 S1-P SRA safety footwear standards. SIP Forestry Class 3 Wellingtons 3SD7 with Double rubber reinforcement in heel area, and laces at calf for custom fit. The excellent sole offers a good grip on muddy terrains, and the 100% vulcanized rubber waterproof Forest-proof provide a class 3 chainsaw protection. Safety steel Toecap with impact resistance of 200J and compression of 1500 daN. SIP Forestry Wellingtons 3SD7 conforms to: EN ISO 17249 : 2013 Level 3; FPA KWF PROFI and EN ISO 20345 : 2011 SB E P SRA safety chainsaw protection footwear standards. Enhanced protection with a 200 Joule Epoxy coated Steel toe cap. Seamless construction with a kick off lug and added shin protection. Moisture-absorbing insole - reduces odour(removable and machine washable). Knitted nylon lining for superior comfort. Certifeid Chemical resistant to EN 943-1 (Chemical protective clothing). Featuring the exclusive SFC-5 Grip enhanced slip-resistant outsole with extra-wide channels for easy maintenance. The mold-injected unibody rubber construction and reinforced heel and toe make this anti-fatigue boot a must have for all-around safety. Used extensively throughout the food production and preparation industry. Steel Toe Meeting DS/EN 345 Standards - 200 Joule. Resistant Against Hydrocarbons, Animal Fats & Vegetable Oils, High Flexibility and Resistance at Low Temperatures. Impact Resistant Cushioned Insoles, Shock-Absorbent Outsoles. 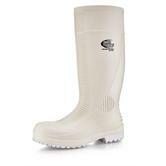 Shoes for Crews Guardian Safety Wellington Height - 39 cm. Conforms to: EN ISO 20345:2011 S4 SRC. Provides users with extra traction whilst walking on ice and snow. Resistant to temperatures as low as -40°C. Easily applied to any sized boot or shoe. The special non slip studs offer excellent traction on ice and snow. Cofra PU anatomic footbed with electrical resistance. Cofra footbed specifically designed and produced with conductive fabric for ESD items. Ideal solution to all ESD footwear. Cofra OHM antibacterial covering with runproof and anti-abrasion fabric made of nylon and silver fibre. Fabric with pure silver closely joined with the surface of a polymer which makes it resistant to high temperatures, granting extra antibacterial power. Magnum Cobra 8.0 M800484 Boots with side zip are a sturdy and hard-wearing footwear. MagnaShield leather and Denier nylon, designed offer excellent protection from the weather, as well as their non-metallic reinforcements providing a safe shell for your feet. Their unique hybrid Waterproof upper gives excellent water repellence, UV protection which over time will damage the integrity of the footwear. Magnum Cobra waterproof membrane inside the boots help to increase the threshold of the water-proofing, to keep your feet warm and dry. Magnum Cobra 8.0 Boots come with a sturdy contour moulded AVE Footbed and composite shank lending you that extra bit of support whilst working. Excellent slip resistance and much better fit adjustment. Sporty athletic appeal with tough industrial strength. This popular style provides the safety and protection of a steel toe. Removable cushioned insoles and a padded collar add hours of comfort. Safety shoes includes Shoes for Crews patented SFC Mighty Grip slip-resistant outsole. 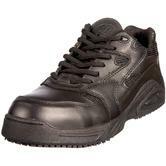 Shoes for Crews Harrier 5258 Steel Toe Cap Trainer conforms to: EN 20345 SFC standards. The Panther 8.0 has a water resistant Magnashield leather and hard-wearing nylon upper for durability. The moisture wicking lining keeps feet dry from sweat, while the removable/replaceable insole offers out-of-the-box everyday comfort - making these boots ideal for shift work. These 8 inch boots also have a TPU reinforced toe box and heel counter for added protection, along with strong rustproof hardware. The high traction SRA slip and oil resistant outsole offers extreme grip. 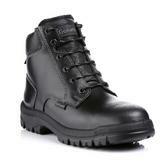 This men's and women's black boot is a popular style with cadets, security, emergency services personnel and volunteers. Safety shoes with SFC 5-Grip Slip Resistant Outsole. Slip-resistant work shoes for chefs are made with chefs in mind. The high quality material makes them easy to clean, they’re comfortable to wear for long hour shifts. Welcome to our range of Workwear on temporary promotion - while stocks last. Here we have a range of items to suit you, whether it is a Workwear Gift Voucher - allowing the recipient to choose from the best brands - or pick up a value bargain from products on sale. Here you can pick up a variety of different kits suitable for work and everyday wear. Kits like the Petzl Headlamp E69P + Hi-Vis Vest + Gloves are ideal for construction workers / road workers. Whereas kits like this Winter bundle are useful to all users. Take pride in your work; take pride in your appearance....but buy Smart and buy the best branded safety products on discount while stocks last! Feel free to explore the site. Watch this space: We are always developing new products to promote to our customers. Boots : EN ISO 20345. Vests : EN ISO 20471, EN13356 . Can't find what you?re looking for then why not check out our range of Discounted Products items or our entire Catalogue.